Pyrizhok (patty) with curds | Шинок "Коса над Чаркою"
One of the oldest Ukrainian dishes which was common back in the day of reign epoch of Kyiv Rus. 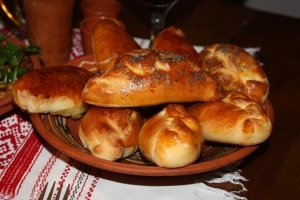 The name comes from the fact that the dough with stuffing which was baked in the oven was served on ” pyru “, that is banquet. So the name itself suggests that for our ancestors it was a festive dish that they did not eat every day. To prepare patties with cottage cheese they took high quality wheat flour. They made dough with the addition of eggs, butter, yeast and salt. In a warm place the dough supposed to come up during half an hour. They shaped balls as big as an egg. Then they rolled down a ball and stuffed it with cottage cheese. Then they firmly closed up the edges of dough. Patties were placed on the baking tray and remained for a little more time to come up. Before they put ‘pyrizhry’ to the oven, smeared patties with egg. Patties were baked in the oven.